Just took some new pictures of the vegetable patch, post the “rat wars” that we have been experiencing here. 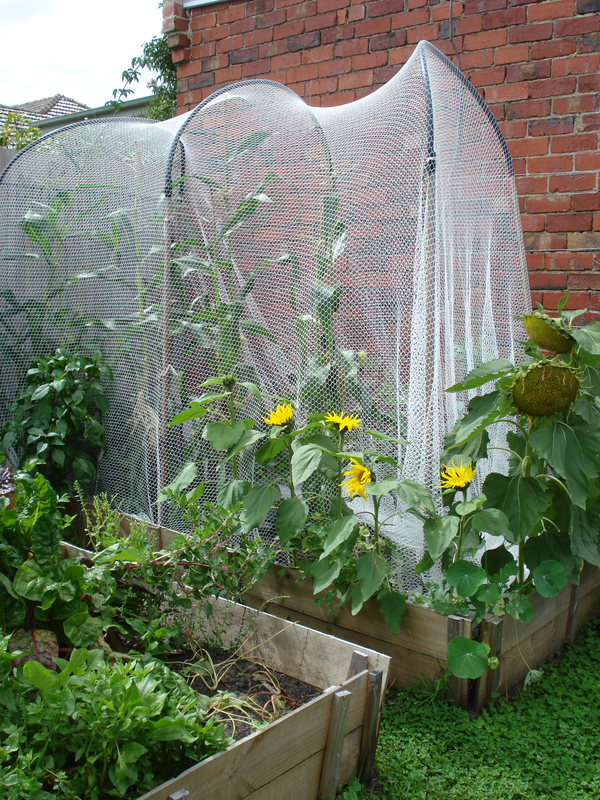 This picture of our corn oddly shrouded and looking just a little like an aviary is part of our efforts to keep the little sods off our veg! So far so good, but they decimated our tomato crop, I think we got about ten tomatos and they got the rest, often just taking one bite then moving on to the next tomato for another single bite. 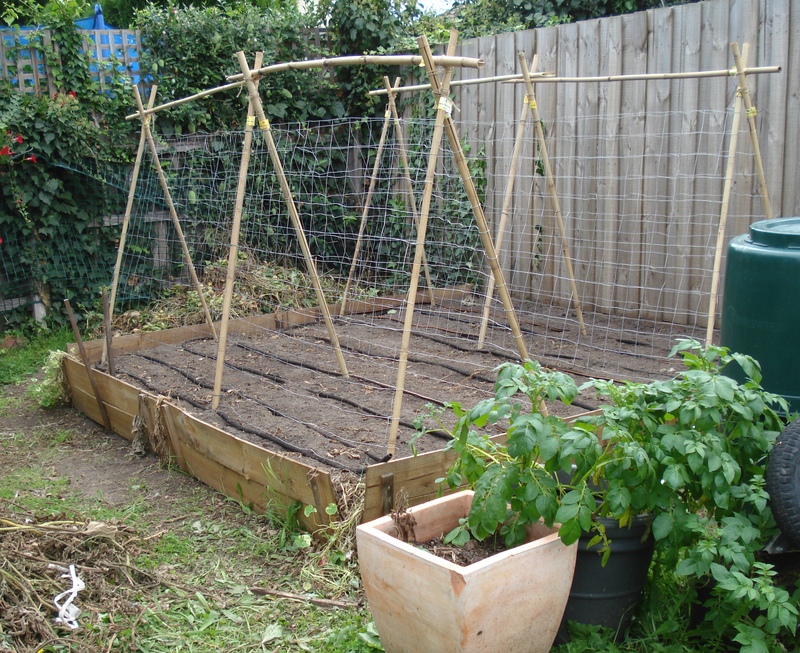 Below is the new look tomato bed, its all peas, haricots, lettuce and little french breakfast radishes now with plans for purple sprouting brocali down the middle. Its really shot up too since I took this photo, the haricots are about 6 inches high and the peas are delightful little tufts of leaves ready to start climbing. We have since had to net it as well, this time to stop the birds digging up the peas and strewing them about for seemingly no reason. You can just make out the pile of old tomato in the pictures here, its forming very nice compost at least. We have learned a lot this year about the various perils of vegetable growing and will be ready for them next tomato season. 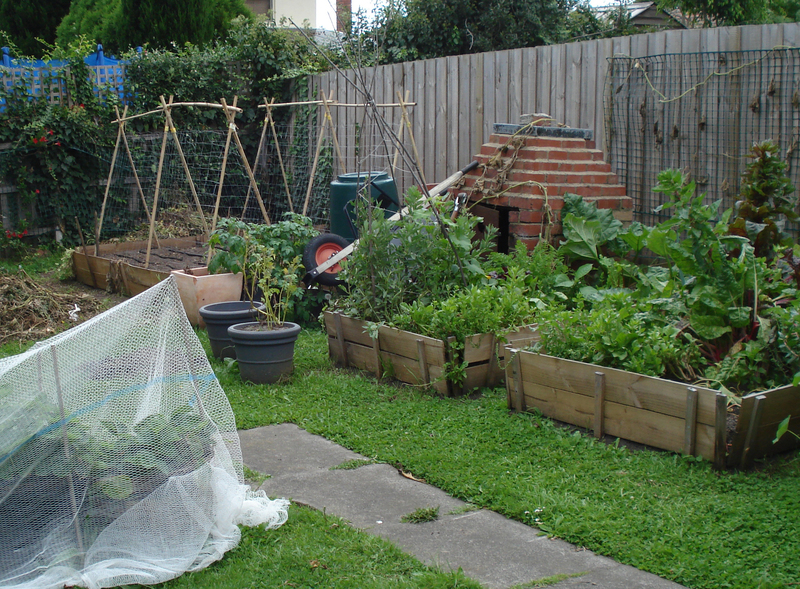 Many people told us netting was no use against rats, so we didnt do it, I wish we had, we might have saved our tomato crop. It is still one of the most enjoyable things in the world to do though and I do love our new pea climber, even if nothing were to grow, I think its really very appealing. This entry was posted on Tuesday, March 29th, 2011 at 6:28 am	and is filed under Uncategorized. You can follow any responses to this entry through the RSS 2.0 feed. You can leave a response, or trackback from your own site. Wow, all that work, this is really inspiring me to really do a proper job with vegetable planting this year. One thing that really surprised me when I was in the UK how many little mice and rabbits are running around but I guess that’s because I was in near Cambridge and close to the fens. Looks wonderful!